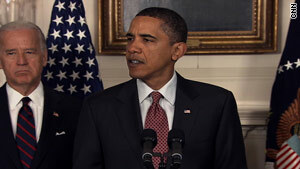 All five task force recommendations will be included in President Obama's proposed fiscal year 2011 budget. Washington (CNN) -- President Obama proposed nearly doubling the child care tax credit for middle-class families Monday, the latest administration initiative meant to reassure Americans nervous about the slow pace of the economic recovery. The proposal is one of five new recommendations from the president's Middle Class Task Force, which was established one year ago this week. It comes as an increasingly populist White House struggles to regain the political advantage among swing independent voters who have flocked to the GOP in recent elections in Massachusetts, New Jersey and Virginia. "The middle class has been under assault for a long time," Obama said in remarks delivered near the White House. "None of these steps alone will solve all the challenges facing the middle class," he said. "But hopefully, [they] will re-establish some of the security that's slipped away in recent years." Specifically, Obama will push to increase the Child and Dependent Care Tax Credit rate from 20 percent to 35 percent for families making under $85,000 a year. Families making from $85,000 to $115,000 also would see an increase in their tax credit, the statement said. At the same time, lower-income families would receive a $1.6 billion increase in child care funding, the largest one-year increase in two decades. In addition, the White House will propose limiting federal student loan payments to 10 percent of a student's income above a basic living allowance. The administration also will push for the creation of a system of automatic workplace individual retirement accounts, requiring all employers to give workers the option of enrolling in a direct-deposit IRA. The "saver's tax credit" would be expanded, with a government match of 50 percent of the first $1,000 of contributions for families making $65,000 or less. Fourth, the White House will propose expanding tax credits to match retirement savings, while also enacting new safeguards to protect retirement savings. Fifth, the administration will push to expand federal support for families caring for elderly relatives, "helping them manage their multiple responsibilities and allowing seniors to live in the community for as long as possible," a White House official said. Since its establishment, the Middle Class Task Force has held 11 meetings around the country and at the White House, according to the statement. All five task force recommendations will be included in Obama's proposed fiscal year 2011 budget, which is set to be unveiled February 1. The president is also widely expected to stress middle-class economic themes in Wednesday's State of the Union address.